"Some adults have said that teens can't learn mindfulness: that teens are either too immature or don't have the patience or attention span to be truly mindful. My experience has been the exact opposite. The teens I have worked with have proven to me that they really 'get it,' even more than many adults." 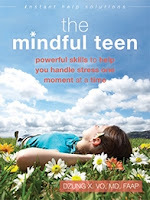 The Mindful Teen is a "distillation of the experience and wisdom of leaders and teachers in the fields of mindfulness, mental health, and positive youth development." "I was looking forward to just chilling out, but one of the meditation teachers assigned me to... wash the dishes in the kitchen after dinner... That first evening, I wasn't very mindful as I washed the dishes. I thought, I can't wait to finish this so I can go do something else... Nonetheless, I kept practicing 'dishwashing meditation' throughout the week... I began to enjoy the warmth of the water on my hands and the feeling of soapsuds between my fingers... Now, to this very day, I truly enjoy washing dishes, and I find it a very peaceful and enjoyable meditation practice." "I ignore my little brother all the time. He's thirteen. One day I was like, 'What if he's saying something important, and I'm not listening to it?' So I sat down with him, and we had a conversation, and I was a lot more mindful of what he was saying, and a lot more mindful of what I was saying to him... I felt like I was spending quality time with my brother, and it felt really nice... I feel like my relationship is a lot better with him now." The Mindful Teen is designed for kids to use on their own, but it would also be an excellent choice as the primary textbook for a mindfulness class. With permission from New Harbinger Publications, in a couple of weeks I'll post Body Scan, a sample mindfulness practice from the book. Dr. Vo has also provided guided mindfulness meditations at MindfulnessforTeens.com.